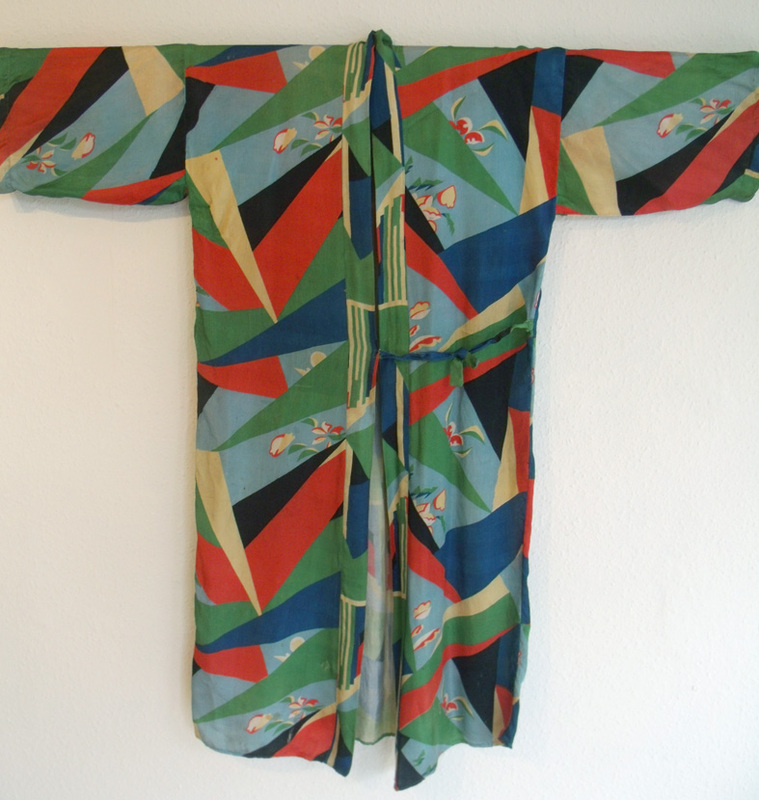 I have started a drawing club at Heart Space Studios, the first workshop was at the weekend and as I have put up a small exhibition of the kimonos that I brought back from Japan, to advertise my kimono making courses, I decided that the first class would be drawing my collection of oriental costumes. 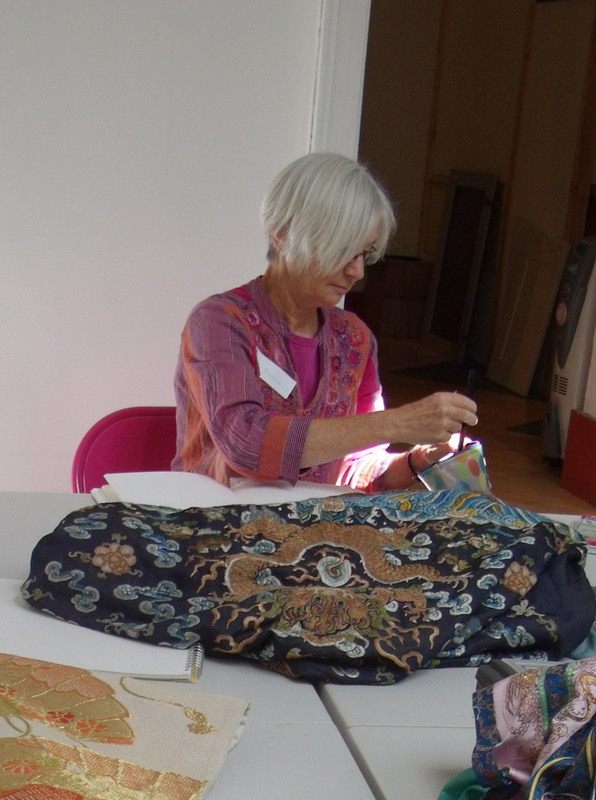 studying the ruined Chinese theatrical robe. 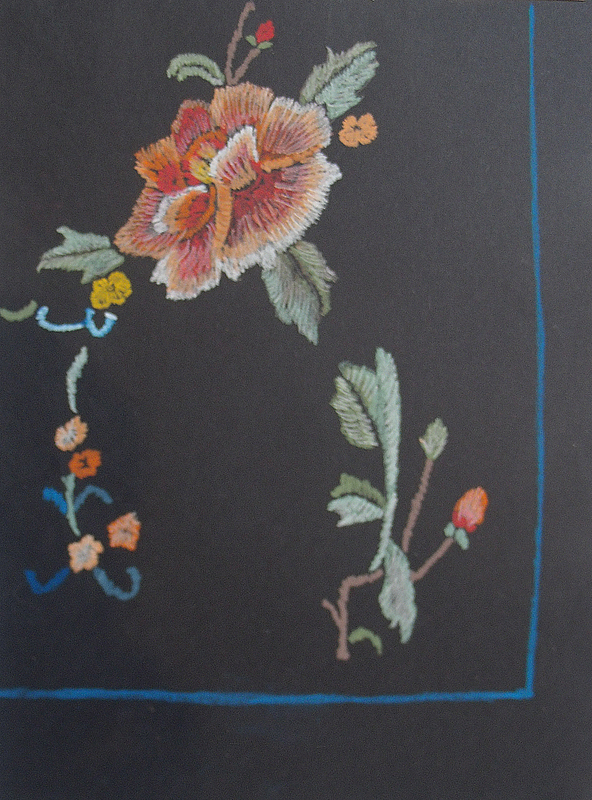 As you can see my collection is very old, very damaged but very beautifully coloured and embroidered. 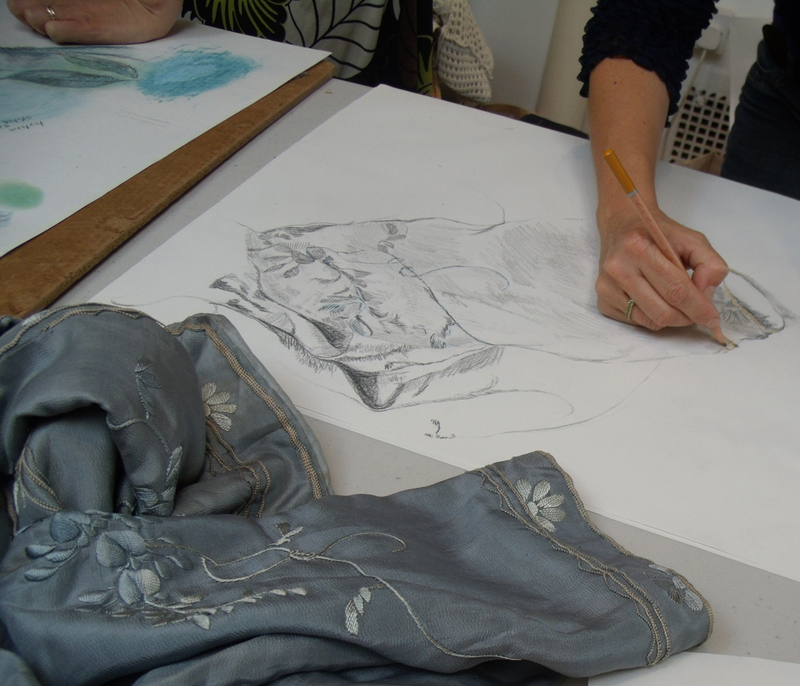 I have used the collection many times for drawing classes and students always find new ways to respond to these lovely old silk clothes. 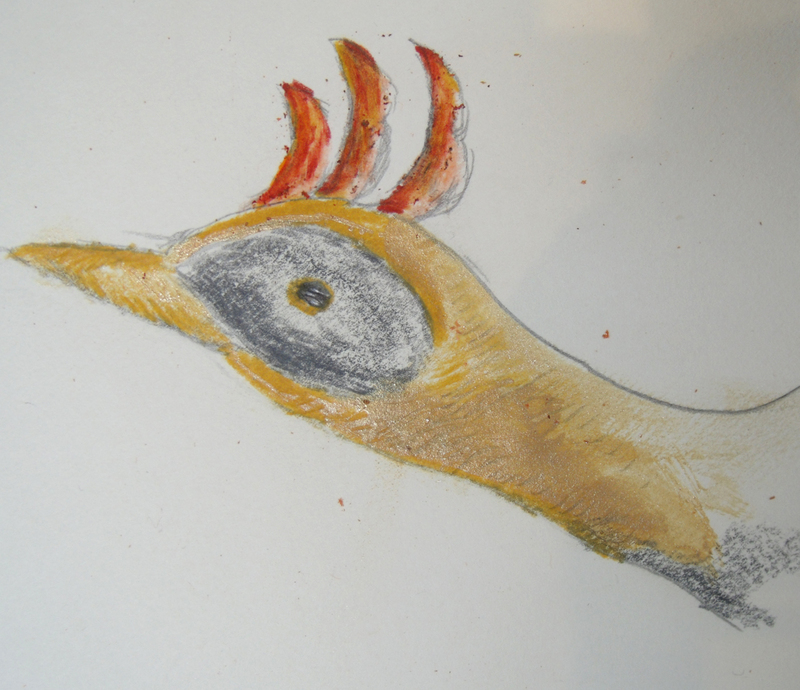 The first drawings are often tentative as people are often really nervous when starting to draw, particularly as this group of students had only just met, but the responses were fluent and quick to emerge. 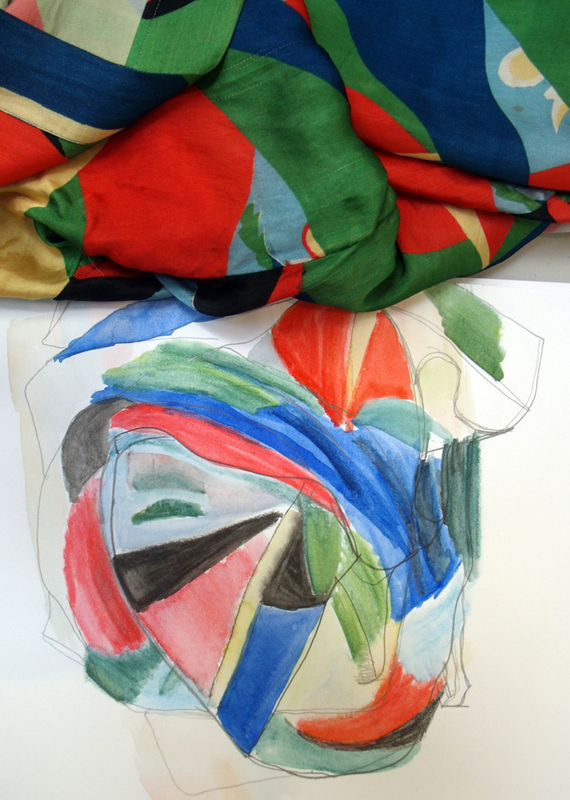 After the first critical overview I suggested that everyone concentrates on getting the colour is the priority for the next drawing of the same fabric, not so easy but still a searching is apparent in the drawing that gives it a life of its own. This often results in a change of focus and makes the subsequent line drawings much cleaner and concise, and not necessarily in pencil. 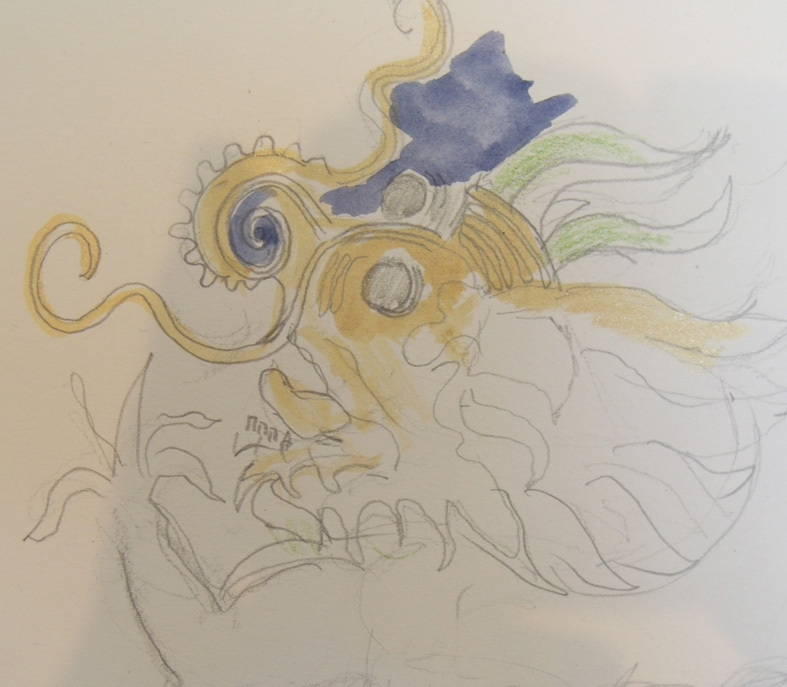 The dragons were very popular. 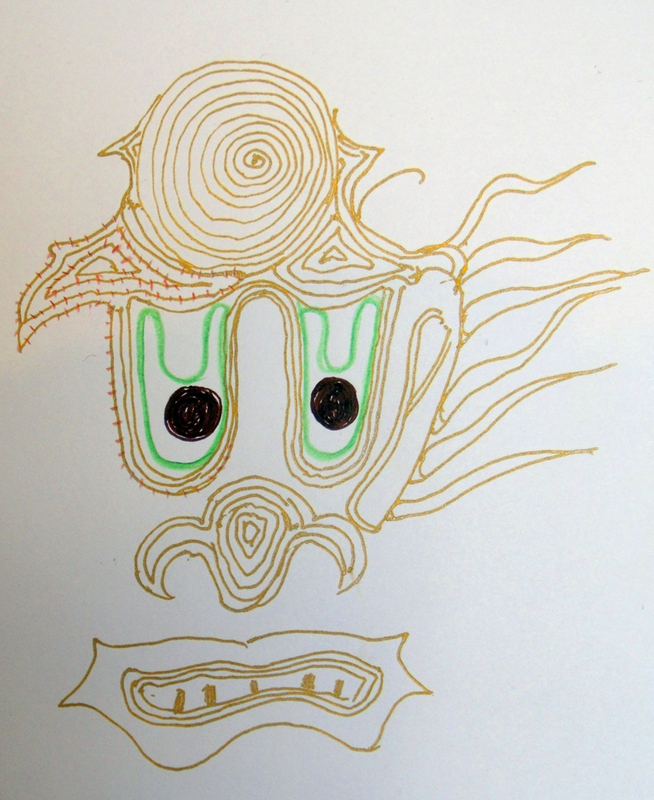 The drawings below have such a curious mixture of terror and comedy, the gold line drawing looks like a piece of graffiti – such energy and character. first dragon drawing in pencil. 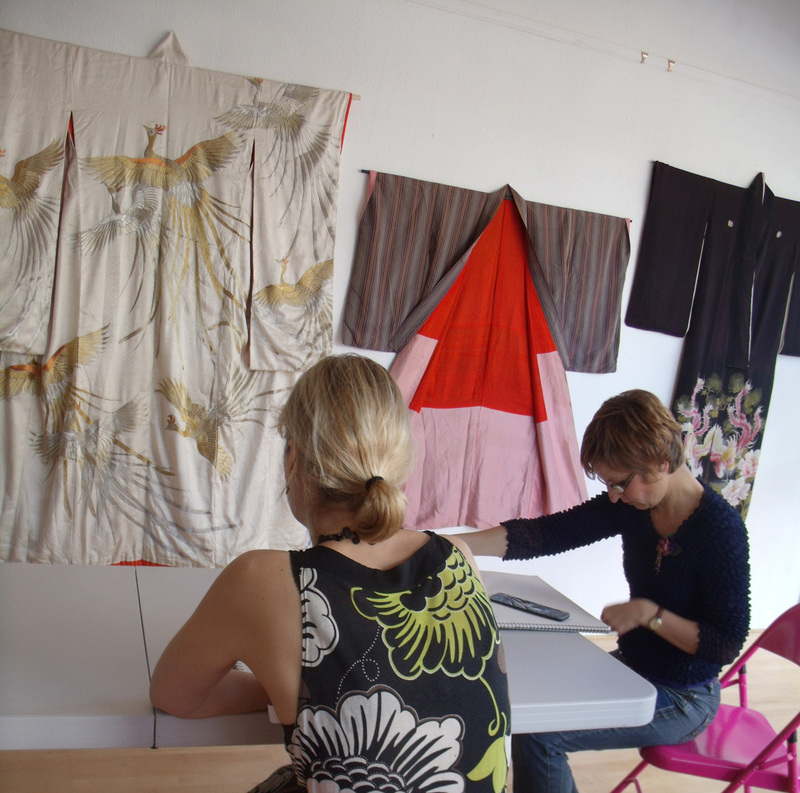 Meanwhile in the front of the studios, where we have a wall as a gallery for hanging exhibitions to advertise our courses, other students were working from the displayed kimonos, the glamorous wedding robe got a lot of attention for the initial drawing session. 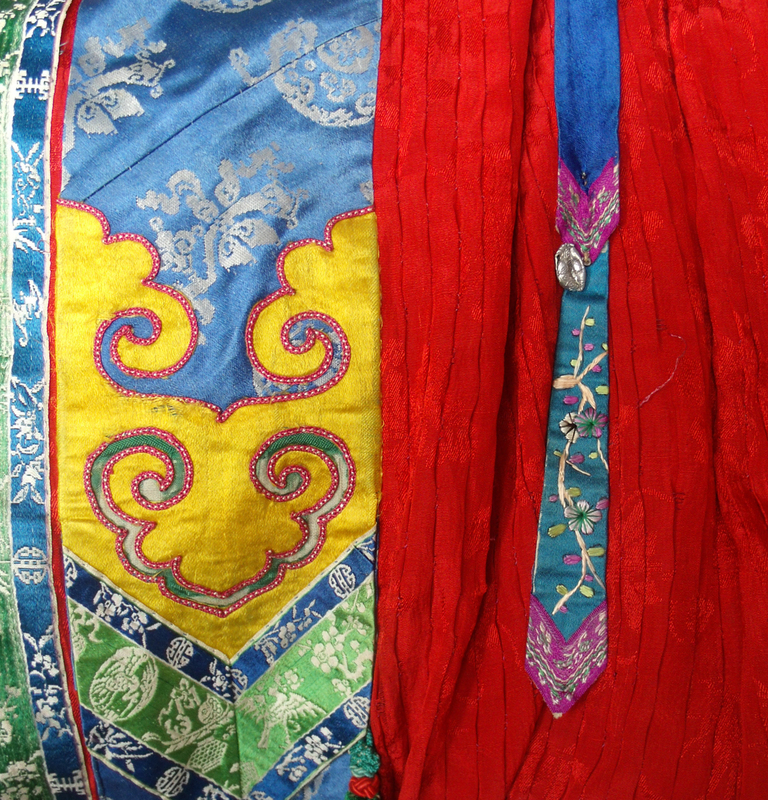 The resulting drawings are really, really tiny in comparison to the actual robes, but attention has been paid to interpreting the colours and giving direction to the stitching. 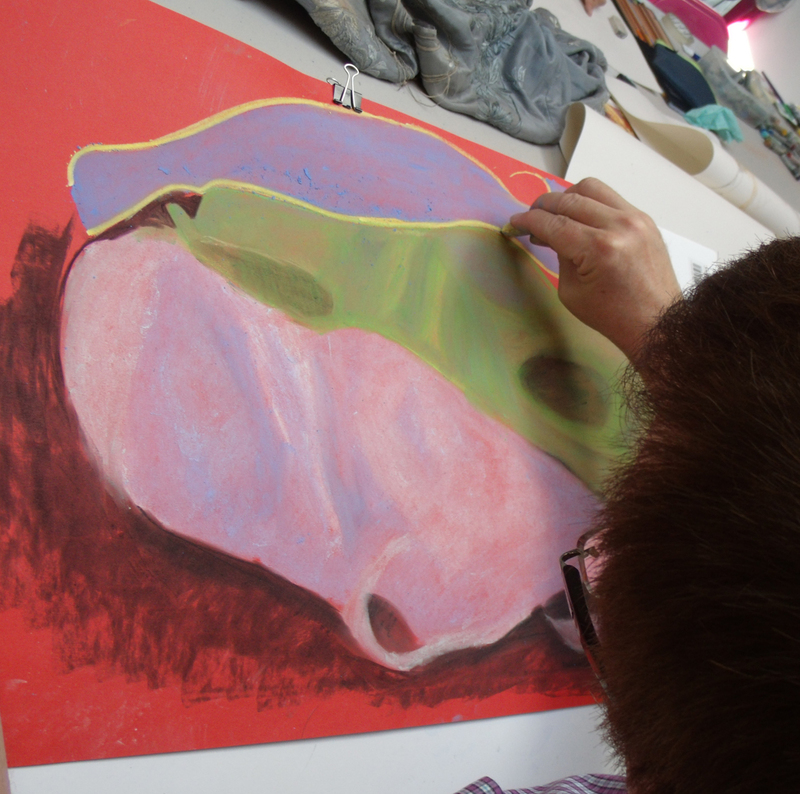 These intense drawings are really difficult to achieve in the small amounts of time I allow for each study – I make sure that to begin with no-one gets enough time to complete anything, I want people to react to what they are seeing, really look to draw in-depth. 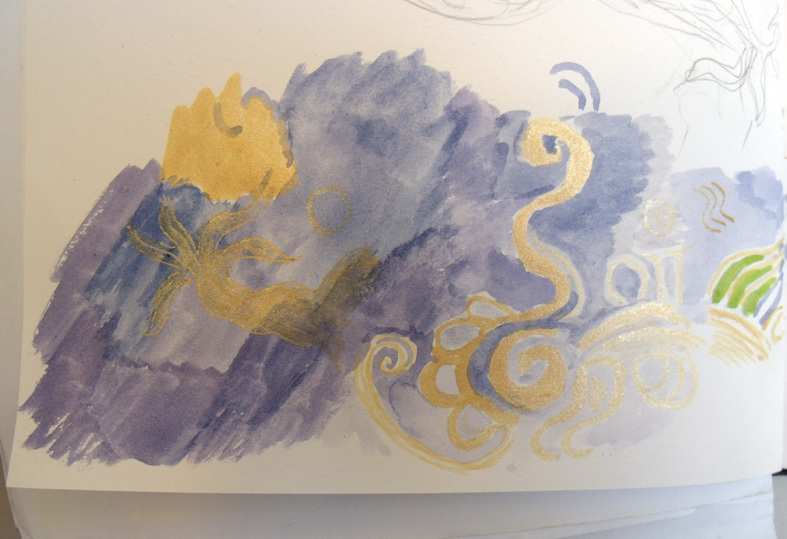 The drawing above looks more like the real feathers of a crane than the gold embroidery it emulates. 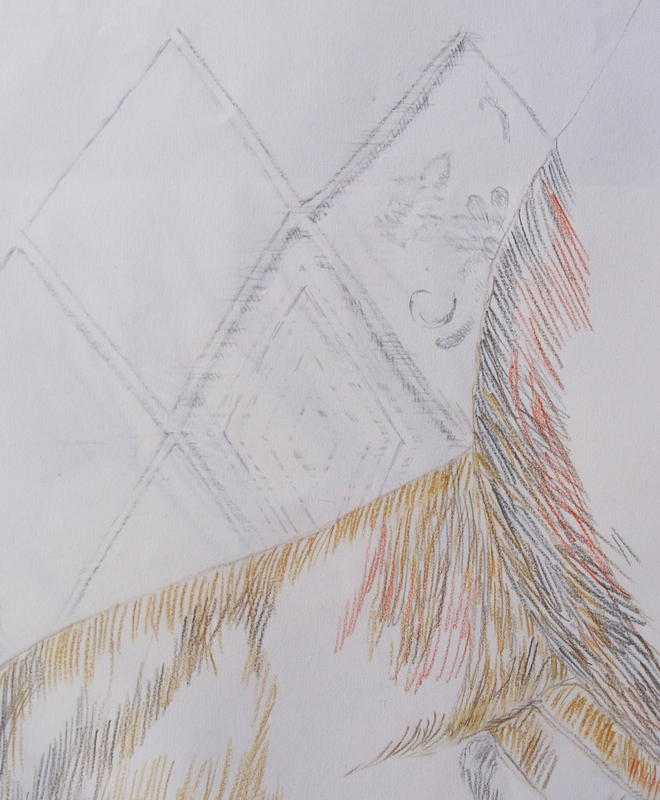 I particularly admire the directional drawing of the stitching, you can tell she is a textile artsist; and the subtlety of the erased pencil lines to describe figured silk is a really imaginative drawing technique. 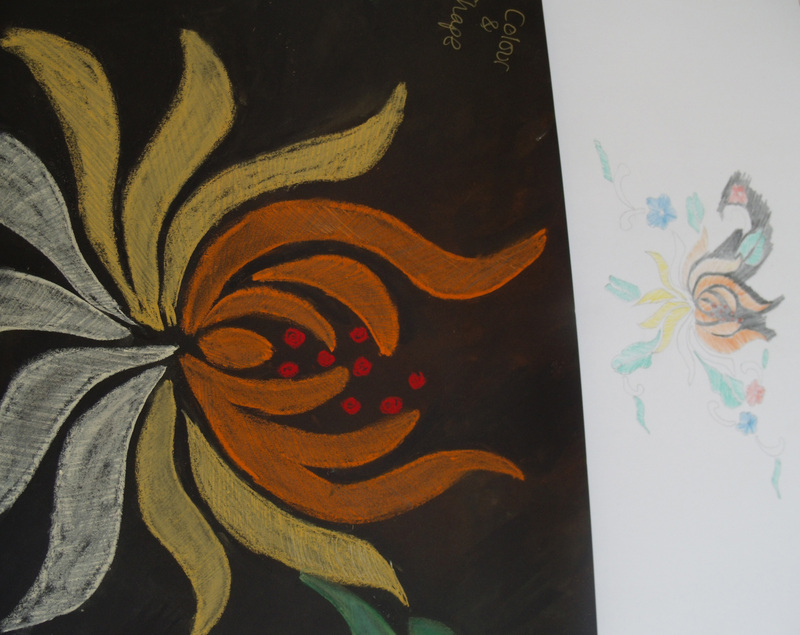 A change of media often results in a change of scale – see below the difference between pencil crayons and pastels. 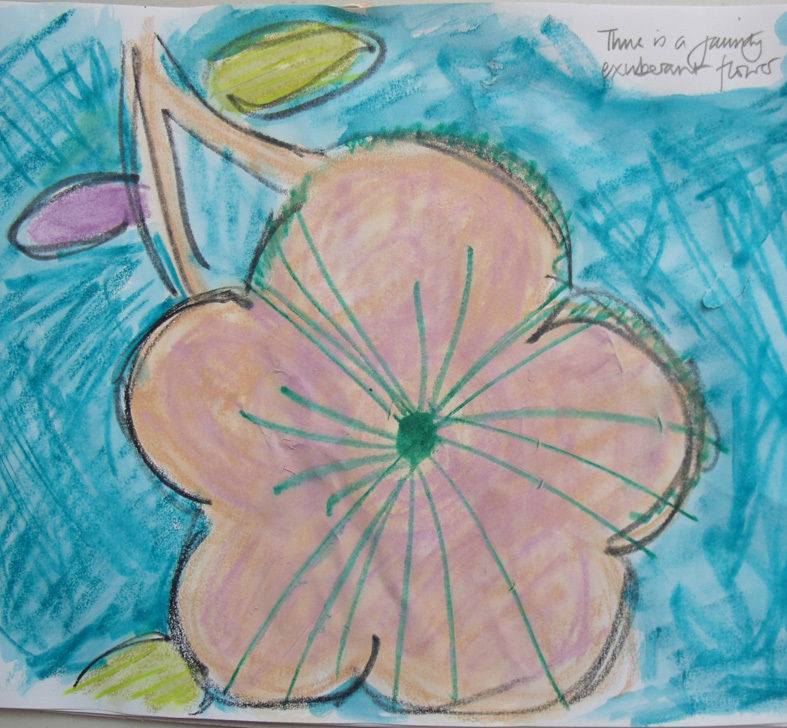 I often get students to experiment with scale to find out if they naturally draw big or small – oh and the change of coloured ground makes a big difference as well – colours glow off black. and a change of scale can also be realised by standing to draw rather than sitting when you have only the arc of your wrist to make marks, the arc of an arm is much wider when standing. 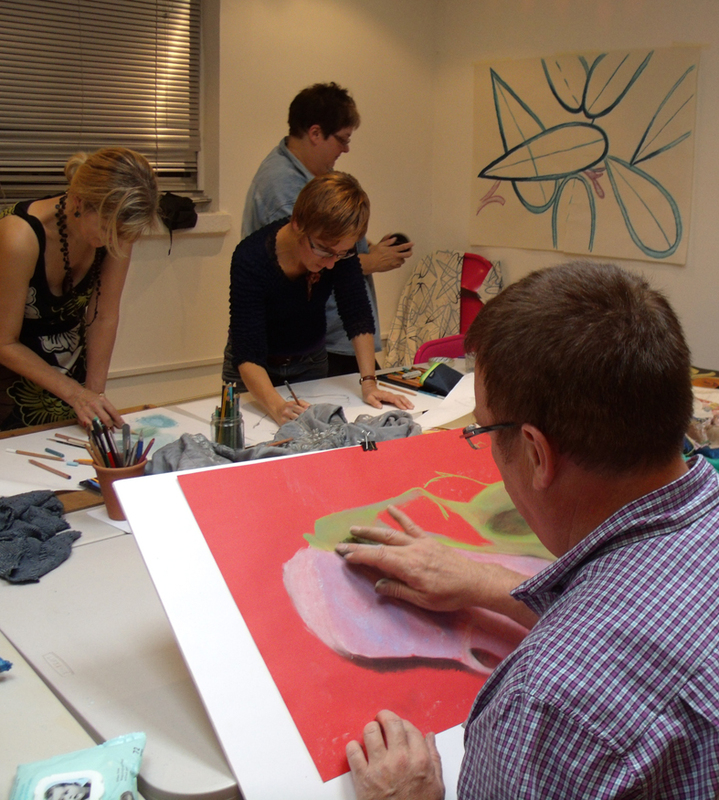 However, sometimes drawing large releases more than just your reach – below Drawing as Therapy. this ‘jaunty, exhuberant flower’ is in response to this minute and exquisite embroidered flower on the tassel tag of a Chinese skirt. 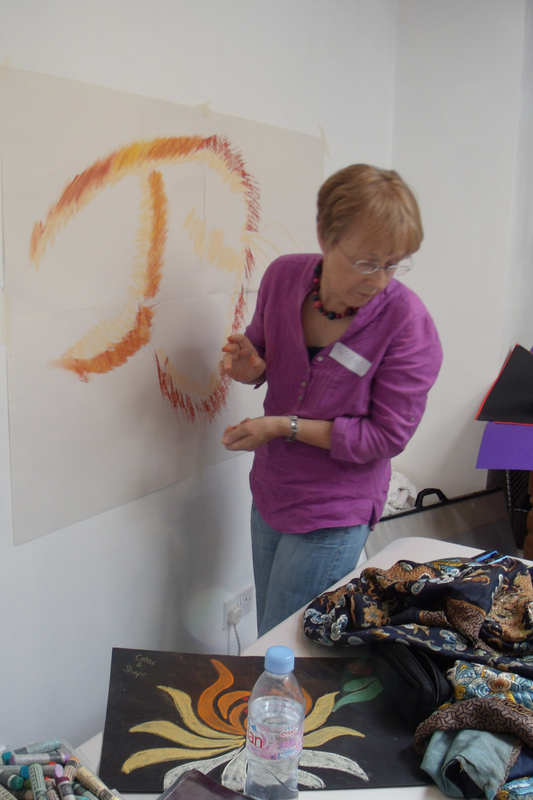 The artist assured me that she felt a lot better by the end of the day ….she was drawing for some other purpose than the one I had proposed – no problem, I’ll rein her in at the next workshop. And this is why I want to run a drawing club, not just individual classes – so that I can work with a group of people and get to know what they like and dislike, how they react to different stimuli, pull them out of their comfort zone to extend their experiences, let them play with lovely materials, fabrics and media – and over the months develop their range of drawing skills and experiences; to have the luxury to let them alone when they need space to think and really mess around, but then to push them to try something else when they feel they have finished. 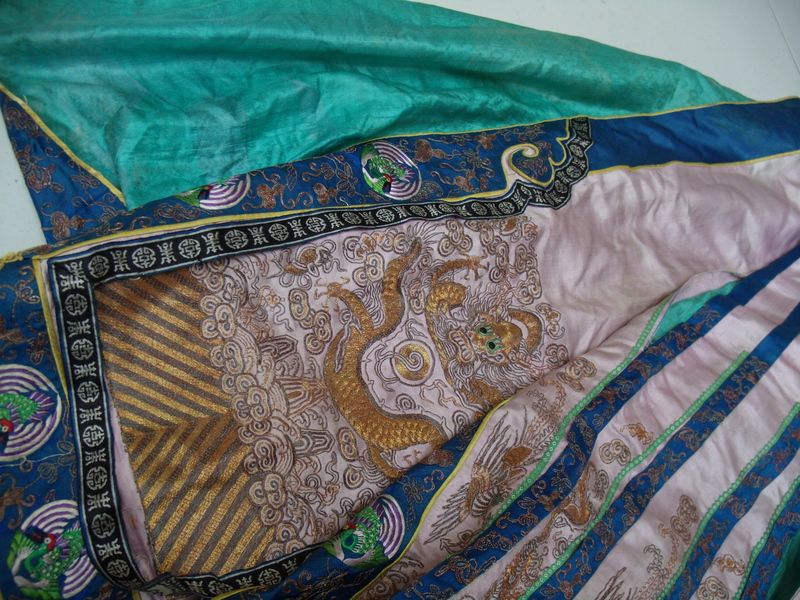 Sometimes a piece of fabrics gets to everyone in completely different ways, above is a pastel drawing of a Chinese skirt, the artist is really trying hard to describe the colour of a soft and faded old pink silk lying next to its green lining…. 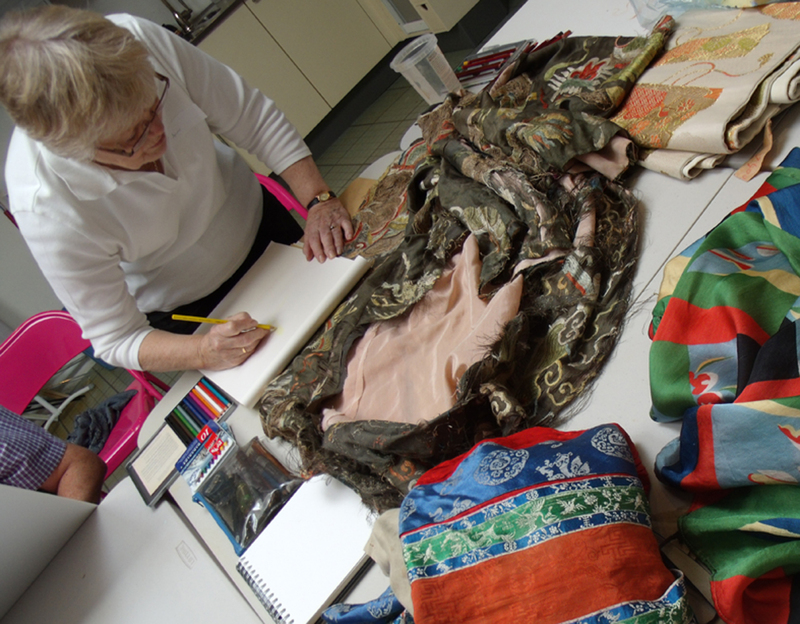 However some fabrics are so simple, strong and vibrant that even in a bundle they cannot be denied their own character. 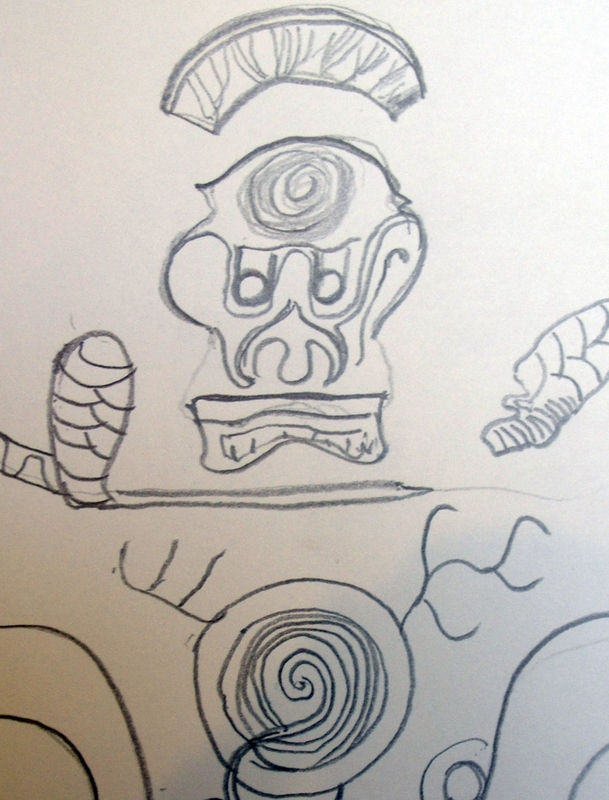 But to return to drawing, observational fine line drawing. One of the last drawings of the day, inspired by a padded silk Chinese embroidered jacket, really shows true sensitivity to the garment. 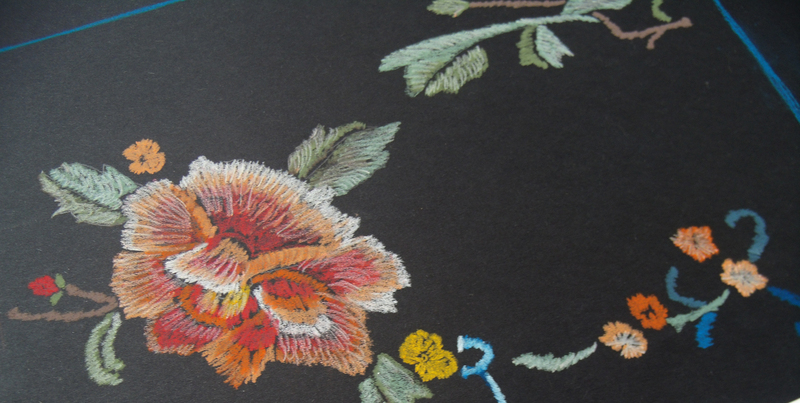 and to finish where I started, here is a pastel study from a modern Chinese embroidered jacket, the student really had been having a bad drawing morning – trying to change the habits of a lifetime in one day – eventually she settled down to a whole afternoon of careful and precise study and here is the very satisfying result.